Big congratulations are in order for Albuquerque-based filmmaker Billy Garberina, his cast and his crew on Necroville. The low-budget horror comedy captured the Tamalewood Award for Best New Mexico-Made Film at last weekend’s mega-successful Santa Fe Film Festival. The film had some stiff competition as this year’s SFFF featured more than 60 shorts, features and documentaries in the New Mexico Film Expo program. Also taking home top honors were Persepolis for Best of the Fest, Ballad of Esequiel Hernandez for Best Documentary, Miss Navajo for Best Indigenous and Off the Grid: Life on the Mesa for Best of the Southwest. Kudos are also reserved for the festival itself, which sold more than 20,000 tickets during its five-day run, making 2007’s eighth annual fest the most successful to date. See you next year! On Friday and Saturday, Dec. 7 and 8, local comedy troupe Eat, Drink and Be Larry will present the premiere screening of their very first, long-awaited feature film Hamlet the Vampire Slayer. 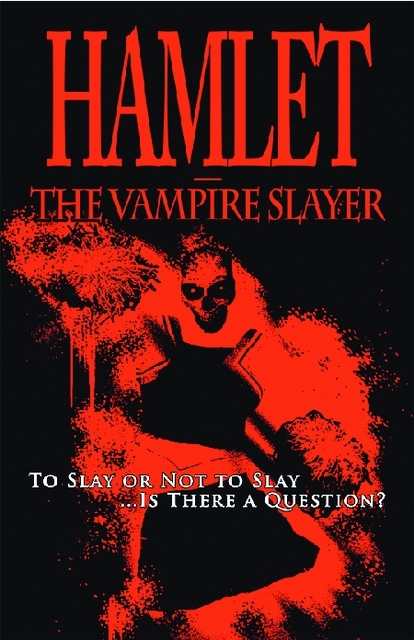 A cinematic adaptation of their award-winning 2006 play, Hamlet the Vampire Slayer reimagines the morose Dane as a wannabe male cheerleader who must defeat a cabal of bloodsucking baddies. The film is written by Jason Witter and Aaron Frale and directed by Jason Witter. Among the cast are Larry regulars Kevin R. Elder, Doug Montoya, Summer Olsson, Leslie Nesbit, George Bach and Andy Brooks. Screenings take place at 10:30 p.m. on both nights at the Guild Cinema in Nob Hill. Tickets are a mere $7 at the door. Inaugurating the FUSION Film Series at The Cell Theatre (700 First Street NW) is a screening of Dziga Vertov’s experimental 1929 Soviet film Man With a Movie Camera. The historic silent film will feature live musical accompaniment by the innovative improvisational ensemble Playroom (featured prominently in The Cell’s production of Mad Hattr). On Saturday, Dec. 8, doors will open at 7:30 p.m. with a complimentary catered reception, followed by the screening at 8:30 p.m. Tickets are available for $20 general admission, $15 seniors and students, catering included. FUSION Film Series will use a digitally remastered print projected with professional equipment on a large screen. For more info or to purchase advance tickets, log on to www.liveatthecell.com.